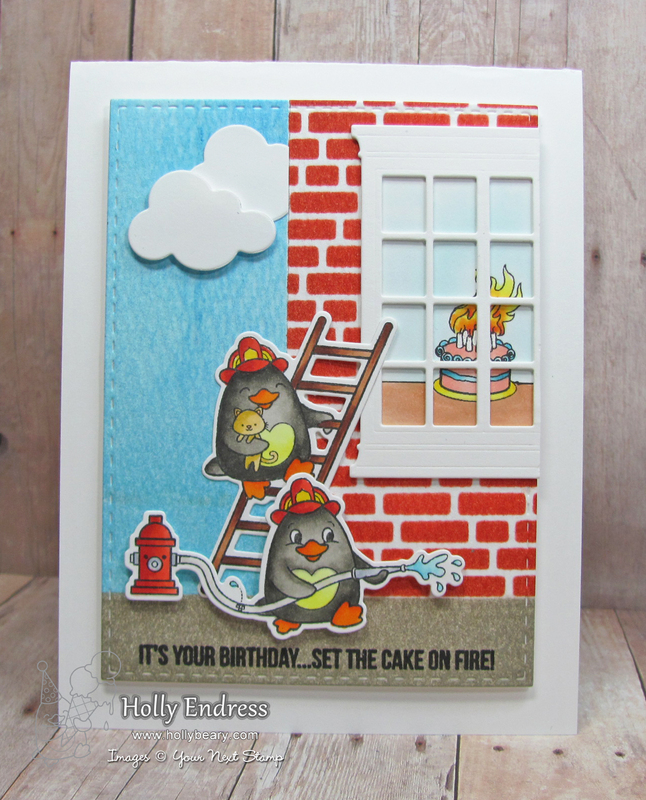 Hollybeary Creations : YNS Feature Day! 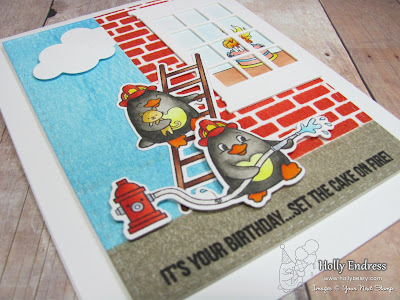 It's time for our Feature Day at Your Next Stamp and this Month we are creating a Scene!! 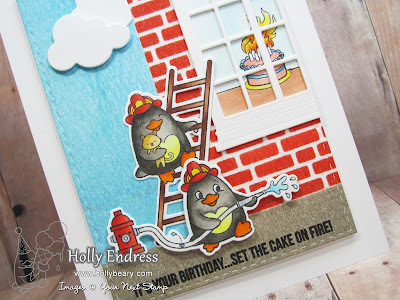 I used the adorable set Waddles to the Rescue and the coordinating dies to create a fun fire rescue scene. I created the Background using a Brick stencil and some Distress Inks. For the sky and ground I masked the area off with some painters tape and used the Distress ink with a mini blender tool. Then die cut the panel with a Stitched Rectangle die. I die cut a window and stamped the cake image from the Waddles set and colored it in with Copics. I added the image panel behind the window and adhered it to the main panel. I trimmed off the excess hanging off. I stamped the Waddles images and colored them in with Copics and die cut them out using the coordinating dies. I stamped the sentiment on the lower portion of the panel and added a few clouds die cut from the Puffy Clouds die set. I adhered the focal panel to a White top folding card stock. Head over to the YNS Blog for more fun inspiration from the team. Leave a comment while you are there for a chance to win a stamp set of your choice. Love your scene! So fun and fabulous!